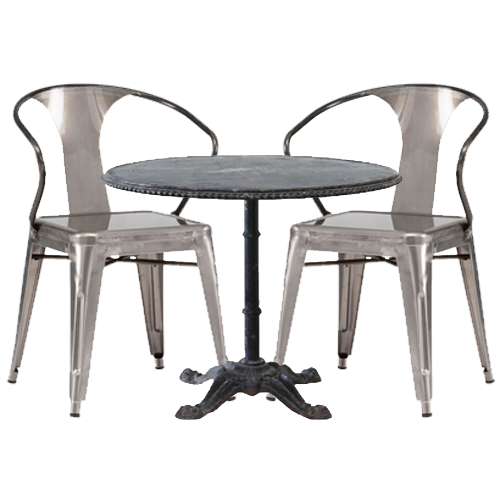 Bring the sidewalk café to your patio with the Dot & Bo Astoria Round Metal Bistro Table and the Bistro Arm Chair in Gunmetal (Set of 2). The Bistro table and chairs are cozy. Buy a few of these to entertain guess. The mismatch of the bistro designs compliments each other. The metal table has a special vintage look, while the galvanized steel chairs take on a more modern and nearly science fiction design. The chairs have curvy backs and a silver shine. Both the table and chairs can be for that special personal dining/dinette room within your home as well as use for patio furniture. Click on the image to view the table. Bistro Arm Chair in Gunmetal (Set of 2). Table and chairs shown on Plaid Summer Beauty Polyvore set.